We are Agoura Hills’ leading home care company with the best and most trusted Caregivers in the industry. We are proud to be known as the go-to home care agency in Agoura Hills that is allowing seniors to continue to live happily at home. Prior to beginning services with us, we will have one of our Care representatives conduct a free in-home consultation so that we can gain a better understanding of the your loved one’s current state. 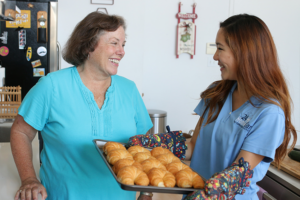 We pride ourselves in taking a unique approach to in-home care by blending innovation and technology with our exceptional customer service experience, with 24/7 accessibility and Signature Specialty Training’s to work with patients that may have Alzheimer’s, Dementia and other illnesses or diseases. Once we analyze your loved one’s situation, we will then be able to provide different senior home care options tailored to your loved one’s schedule, comfort level, and health issues. Our combination of world-class customer service, innovation, and passion for the latest advances in technology allow 24 Hour Home Care to provide a type of home care unrivaled by the competition. No one should feel alone during this trying time, you have just discovered your new found friend in the home care industry! Please call (818) 385-0227 to speak with one of our associates at the Encino branch today!